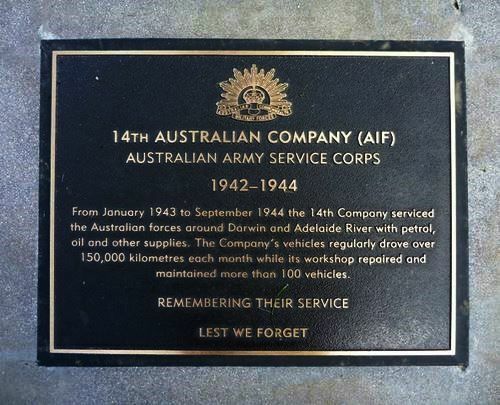 The plaque commemorates those who served in the 14th Australian Company during World War Two. From January 1943 to September 1944 the 14th Company serviced the Australian forces around Darwin and Adelaide River with petrol, oil and other supplies. The Company`s vehicles regularly drove over 150,000 kilometres each month while its workshop repaired and maintained more than 100 vehicles.